Sophomore guard Maceo Jack makes a drive to the basket during Saturday's game against Richmond. Updated: Feb. 11, 2019 at 3:01 p.m.
Men’s basketball (7–16, 3–7 A-10) could not stifle Richmond’s (10–14, 4–7 A-10) hot performance from beyond the arc Saturday night. The Spiders tallied 39 points off three-pointers – including 24 in the first half – and finished the night shooting at a 56.5 percent three-point clip to take an 89–63 win at home over the Colonials. Jack led all scorers with 23 points, a career-best performance, while redshirt junior guard DJ Williams added 16 points to the effort. The Colonials were shut out under the glass, grabbing a season-low 18 rebounds on the night and no offensive boards. Sophomore forward Javier Langarica grabbed a team-high four rebounds. Sophomore guard Terry Nolan Jr. – who put up a team-high 16 points against Richmond last month – did not play due to illness and freshman forward Marcus Littles was also out with an illness for the second game in a row, according to an athletic department spokesman. 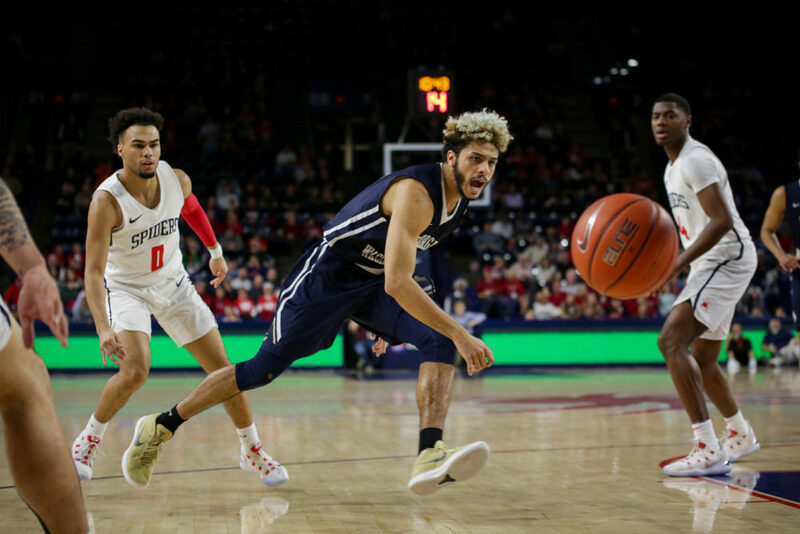 The Colonials finished the night shooting at a 48.0 percent pace – one of their better shooting performances on the season – but managed to put up 40 shots compared to Richmond’s 53. The Colonials were the first to get on the scoreboard thanks to a jumper at the foul line from Langarica. GW only managed to hold the lead for 18 seconds before redshirt sophomore guard Grant Golden put the Spiders in front with two-straight baskets. A three-pointer pushed Richmond in front by five points, but a made three from Jack and a layup from Langarica dished out by sophomore guard Justin Mazzulla tied the game at 7–7. Sophomore guard Justin Mazzulla watches as the basketball goes out of bounds during Saturday’s game against Richmond. Both teams continued to trade points for a few more minutes of play, but Richmond buried GW with three-point shooting to take a solid lead. The Spiders were shooting 61.5 percent from the three-point line on an 8-for-13 clip in the first half. Joseph said part of his game plan had been to force Golden off the block using a zone defense so he would be forced to take shots further out. But Golden finished 6-for-10 from the field on the night, including one made three-pointer. “It’s one of those nights where you look at the staff and you spend millions of hours on a game plan and it’s like, ‘you’ve got to be kidding me,’” Joseph said. Richmond extended its lead to as many as 19 points while GW struggled to get off good shots and stifle the Spiders’ three-point performance. 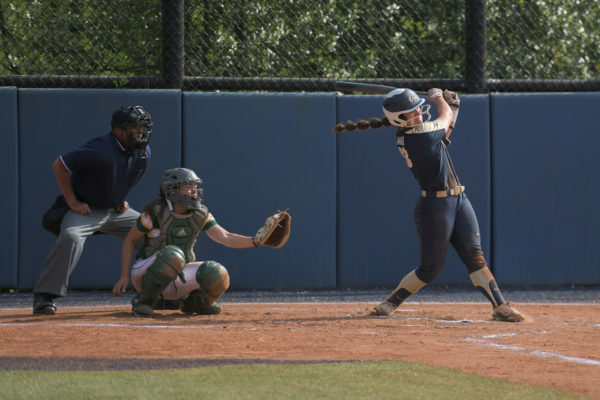 The Colonials got back in the game through a 13–3 run in the final minutes of the half. The Colonials ultimately pieced together a solid shooting performance in the first frame, shooting at a 46.4 percent rate as they headed into the locker room for halftime trailing 43–30. GW was again the first team to get on the board to start the second half when Williams sank a mid-range jumper, but Richmond continued its hot streak into the second half. Although the Spiders continued to attack from beyond the arc, tallying 15 points from the three in the half, they turned their attention to the paint in the second frame. With Langarica sitting on the bench for most of the half with four fouls, Richmond racked up 26 points in the paint. With about 12 minutes to play, the Spiders went on a 15–0 scoring run to boost their lead 29 points at 76–47. Freshman guard Mezie Offurum broke the Colonials’ scoring drought four minutes later with two made free throws, and Jack piggybacked with six-straight points to lessen the rout. 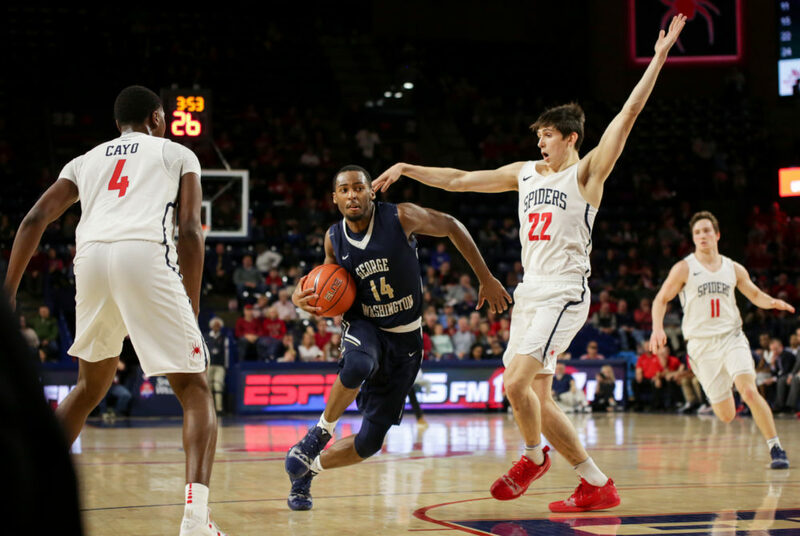 The two teams continued to trade baskets until the clock wound down, with Richmond sophomore guard Jordan Gaitley tossing in a final layup for the Spiders to end the 26-point romp. “I told our guys in the locker room, there’s a lot of basketball left, there’s a lot to play for and our guys are still together – our guys are still connected,” Joseph said. The Colonials will return to action at the Smith Center Wednesday when they face off against Saint Louis. Tipoff is scheduled for 6:30 p.m. This post was updated to reflect updated stats from the game. The game stats previously incorrectly reported point totals for two players.